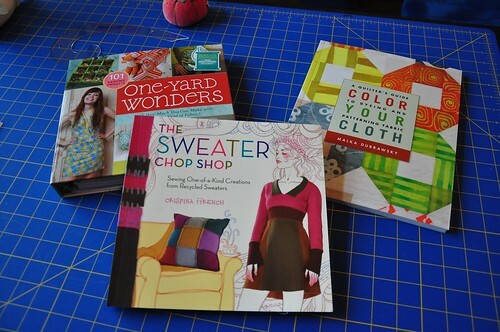 I've been adding to my craft book stash on a regular basis lately. I probably spend more on books than I do on fabric or yarn. Here are my most recent purchases. I pre-ordered One Yard Wonders and it's a beautiful book. It's spiral bound, so it lays flat. It came with patterns and is nicely photographed. But, there aren't as many fresh ideas as I had hoped to see. I think it would be great for a beginning seamstress and would serve as a great reference for loads of basic patterns. I can't wait to make the fabric origami box (on the cover). The Sweater Chop Shop was worth every penny. I love it. I've got a stash of old sweaters that I started collecting a few years back for felted projects, and this gives me some great ideas. I highly recommend this one. Color Your Cloth is another gorgeous book. Even if I never dye a single piece of fabric, I'll enjoy having this one just because it's beautiful to look through. I love the colors and can't wait to try some of the techniques. I have a friend from Indonesia who brought me some batik wax and a Tianjin from a recent trip home. I just had them on display, but now I think I'll use them! On another note, here's the string quilt I started a few weeks ago. I'm going pretty slow, but I love the way it's coming together. I cut into some of my Heather Bailey stash (Fresh Cut) and I'm glad I did because I love the subtle colors. I think I've got fewer than 50 blocks to go. I'm anxious to finish up some UFO's this week. I want to quilt my scrappy log cabin and try to finish the Green Gable sweater I started last summer. Maybe I'll go look for something to finish right now. nice choice on the books! i used to work at a bookstore so i did the same thing you are doing!! 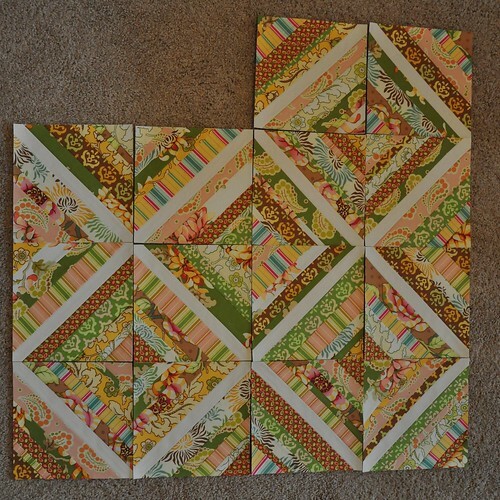 Love how your string quilt is coming along. I agree that the colors are spectacular. I don't know why I'm taking my time about getting on the bandwagon with this technique... I think it's time I give it a shot.